January was all about pens and lettering! First up we included a 10 set of Maped Graph'peps fineliners. These extra-fine .4mm felt tip fineliner pens are great for drawing and detail work. the metal nib protects the tip when using rulers, templates and straightedges. Next up we included a Fudebiyori brush pen from Kuretake Zig. Its water-based dye is optimized for brush lettering and stroke weight control. Its semi-flexible tip allows easy control and great pressure response against surfaces. We also included two Tombow Twin Tone pens. These are new double-sided markers from Tombow. You can create thick or thin lines with two tip choices - either a broad .8mm bullet tip for bold lines or an extra-fine .3mm tip for detailed, precise lines. Next up we included a Pentel Razor Point II. These pens offer an extremely fine .2mm fiber tip that is perfect for adding detail or contrast to lettering. We also included a Itoya Doubleheader Calligraphy Marker. It has two chisel points that give the option of thick or thin lines: a 3.0 mm wide point for bold, distinctive lines and a 1.5 mm narrow point for smaller, intricate designs. We also included a Tombow Dual Brush Pen. A double-headed brush-pen with a flexible nylon fiber brush tip on one end and a fine tip on the other. With non-toxic, fast drying, water-based odorless ink that blends to create any color desired. It's brush tip is great for brush lettering techniques. We also included a Faber-Castell Pitt calligraphy pen in sepia. With its highly pigmented India ink and 2.0 mm chisel tip, this calligraphy pen is great for lettering and coloring. Finally we included a Kuretake Zig Memory System in teal. This marker features dual nibs including a narrow 2mm tip and a super broad 5mm tip. It’s ideal for adding color and dramatic calligraphy to your new art. 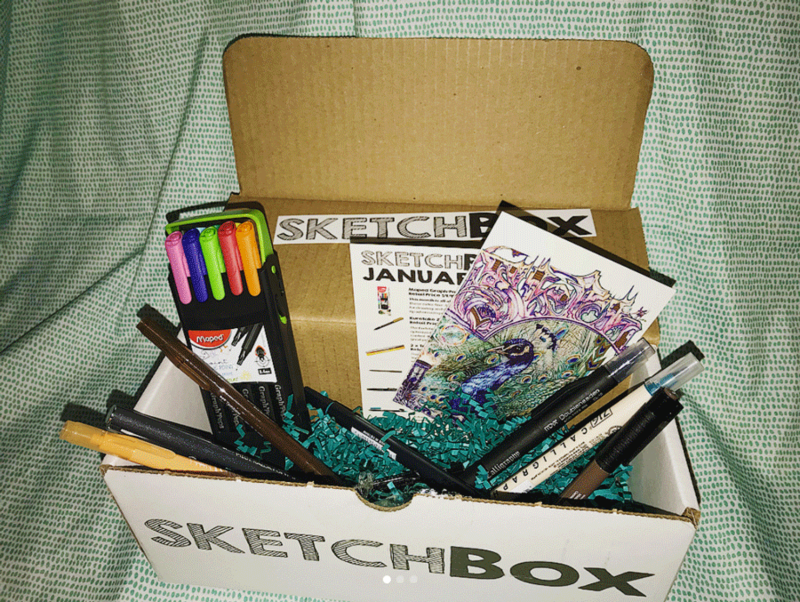 The picture of this box was taken by our subscriber @theluckycactusart on instagram.